UPDATE: I posted a better version with more details. Click on the link. Most Americans work for someone else. Entrepreneurialism is rare. 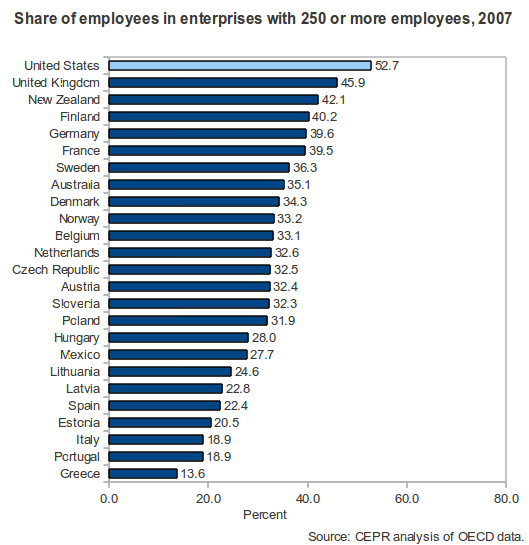 Would it be better for America if average firm size shrank and there were more, smaller firms? Economists like Leopold Kohr and E.F. Schumacher belived that “Small Is Beautiful” and all politicians seem to lionize small businesses. But countries with only small businesses (and more entrepreneurs) are poorer than countries that are more dominated by big businesses. Of the OECD countries (the club of rich nations), the US is by far the most dominated by large businesses and the OECD nations that are most dominated by small businesses are all relatively poor. It appears that US small businesses have been growing at the expense of large ones, so is that a good thing? Matt Yglesias argues that the existence of large businesses is a sign of trust in an economy and therefore their shrinkage may be a bad sign. Trust is certainly good for the economy and the fact that Americans are more trusting of each other than most counties has been a boon for the US economy, but there are many other reasons that could cause the relationship between firm size and economic wealth. Politicians often tout the virtues of small firms as a way of signaling support for dynamism and entrepreneurial spirit… But it turns out that some of the most troubled economies of Europe are precisely the ones that are most dominated by small businesses. And this is no coincidence. An economy where a huge share of the population works at small businesses is not one that is friendly to entrepreneurs, but rather one that has widespread corruption and poor regulation. The key to prosperity is not to coddle small firms, but to give people the tools they need to start one and the firms that exist the ability to thrive and compete. John Schmitt, an economist at the Center for Economic Policy Research in Washington, D.C., pulled together some striking data last fall from an Organization on Economic Cooperation and Development report on entrepreneurship showing that the United States has a strikingly low percentage of its workforce employed by small businesses. The countries at the other end of the spectrum, however, aren’t dynamos—they’re basket cases. 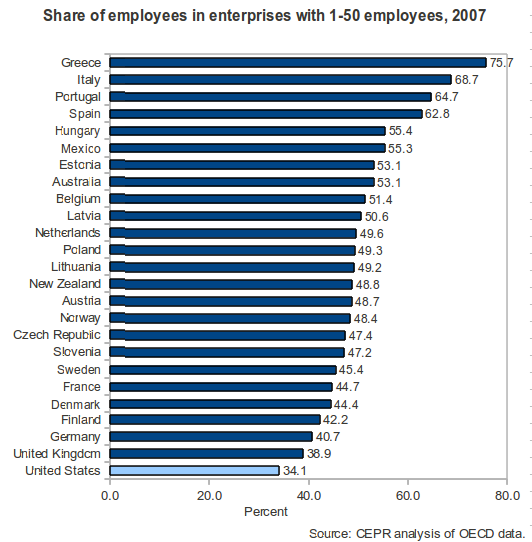 If you look at share of the workforce employed by firms with fewer than 10 workers, the leaders among OECD members are Greece, Italy, Portugal, Mexico, and Spain. 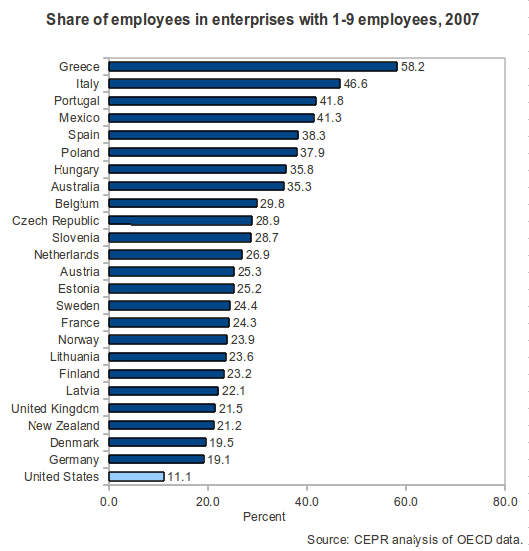 Only 11 percent of employed Americans work at firms with fewer than 10 employees while 58 percent of Greeks do. Expand it to look at the share of the workforce employed by firms with 50 or fewer workers, and you get Greece, Italy, Portugal, Spain, and Hungary. About one-third of employed Americans work at firms with fewer than 50 employees while 75 percent of employed Greeks do. One issue is trust and corruption. One of the most difficult aspects of modern social life is that the world is a big place and cooperating with strangers is difficult. After all, they might rip you off. You could appeal to the authorities, but the authorities are likely to be strangers, too. In societies with poorly functioning institutions, high levels of corruption, and low levels of social trust, it makes sense to try to stick with smaller-scale entities. Business relationships are driven by family and personal ties rather than contracts, and a small scale is used to solve the difficulties of impersonal administration. It’s not a coincidence that if you look at Transparency International’s Corruption Perceptions Index, the four worst-performing eurozone members are our old friends Greece, Italy, Portugal, and Spain. The converse is that large-firm employment is most common in English-speaking and Nordic countries that have the least corruption. Keeping economic units small is a perfectly reasonable response to a less-than-ideal situation, but it’s very economically limiting. Economies of scale can make larger firms more productive and let medium-skilled workers specialize more and earn higher wages. A bigger issue is that great ideas deserve to start small, prove themselves, and then grow. Not every business owner wants to build a Fortune 500 company, but sticking forever with a staff of fewer than 10 people is very limiting. …It ought to be the case that the worst-managed shops close and the best-managed shops branch out and prosper. That way more people would end up working for managers who know what they’re doing, rather than managers who happen to have inherited a license. Such competition-stifling rules are not unheard of in the United States. An idiosyncratic regulatory framework explains why you’ve traditionally had to buy a car from a locally owned car dealership rather than from a national retail chain or directly from a manufacturer. But the fact that most Americans work at companies with more than 250 employees while almost 70 percent of Italians work at firms with fewer than 50 highlights the scale of the difference. The strength of the Nordic and Anglophone models, from an entrepreneurial perspective, is that these are the places where it’s easiest to start a business and also the places where it’s easiest for one to grow. So big business is good for the median person IF we can keep that concentrated power from exploiting the rest of us and corrupting society. Every rich country has figured out how to do it, but this is one of the ongoing challenges in Latin America, Russia, and countries that suffer from the resource curse. Concentrated business power can corrupt society and entrench a de facto caste system of class privilege.